I've had the Tinkered Tactics Combat Tier Base Set for a couple of months now, and I wanted to share my thoughts on it. 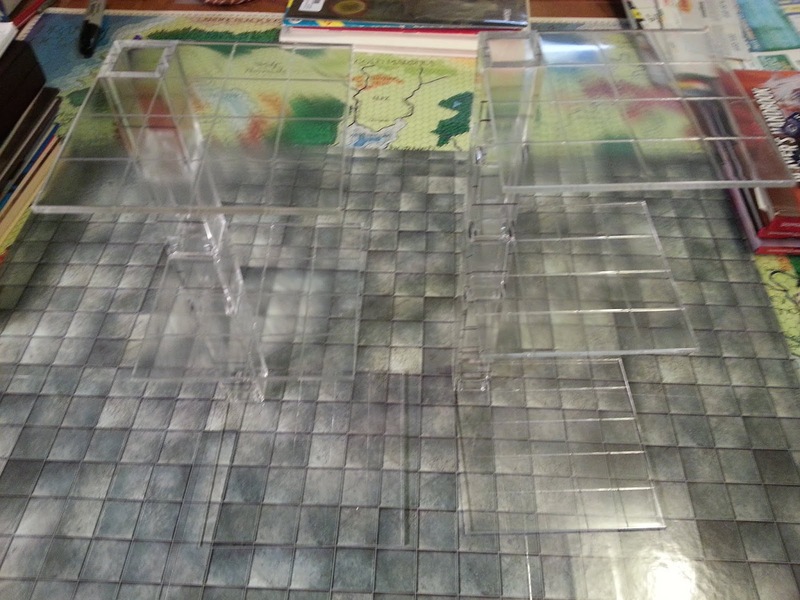 Let me start off by saying: these are extremely useful, and although there are a couple of drawbacks (which I'll discuss below) I think they're still a good investment for gamers who regularly use miniatures in their games, especially role playing games. 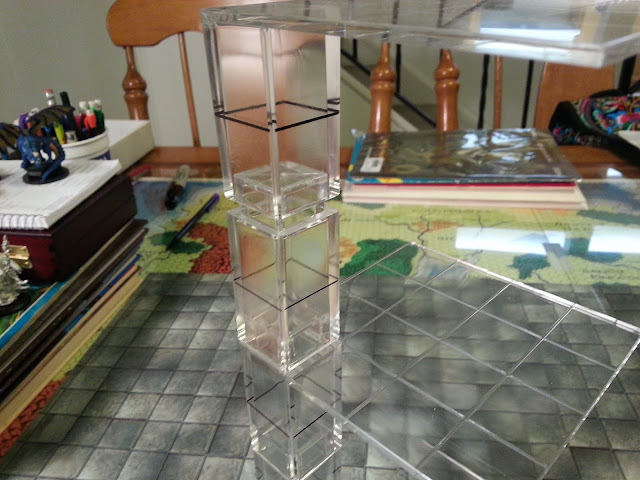 The Base Set box includes 10 pieces: one pair of 5" x 5" bases/bottom platforms (can only be connected to other tiers/risers above them), one pair of 4" by 4" middle platforms (can be connected to other tiers/risers above or below them), on pair of 4" by 4" top platforms (can only be connected to tiers/risers below them), one pair of 2" risers, and one pair of 4" risers. The middle and top platforms each have a 2" riser built into them (below the platform). It's nice to be able to show heroes'/monsters' relative positions without having to use dice, pieces of paper, or some other ad hoc solution. What's more, the tiers add a nice visceral touch to my games, which is never a bad thing. There's nothing quite like seeing that hero model floating "dozens of feet" above the battlefield, facing the monster toe-to-toe. For this, alone, I feel like I got my money's worth from the tiers. There's a wide enough array of pieces in one Base Set box to allow you to build a trio of two-tier platforms (one ground and one flying tier), if you're clever and daring enough to invert one of the top platforms and use it as a base; a pair of three tier-platforms (including ground level); or one four-tier platform and one two-tier platform. 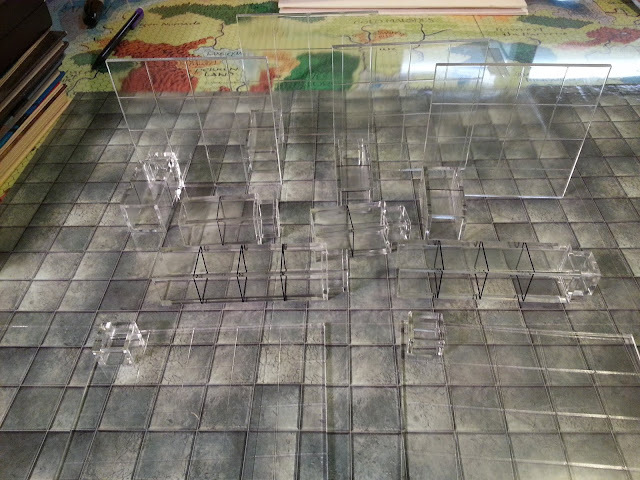 It's a nice variety, more than enough for most small- to mid-sized role playing game encounters. The platforms have textured, easy-to-see 1" grids, and the risers have black lines (a little more difficult to see against dark backdrops) at the 1" mark. The platforms and risers are otherwise clear, so they don't significantly affect visibility - something that's especially appreciated in a cluttered encounter. Another great aspect of the tiers is the area of each platform. 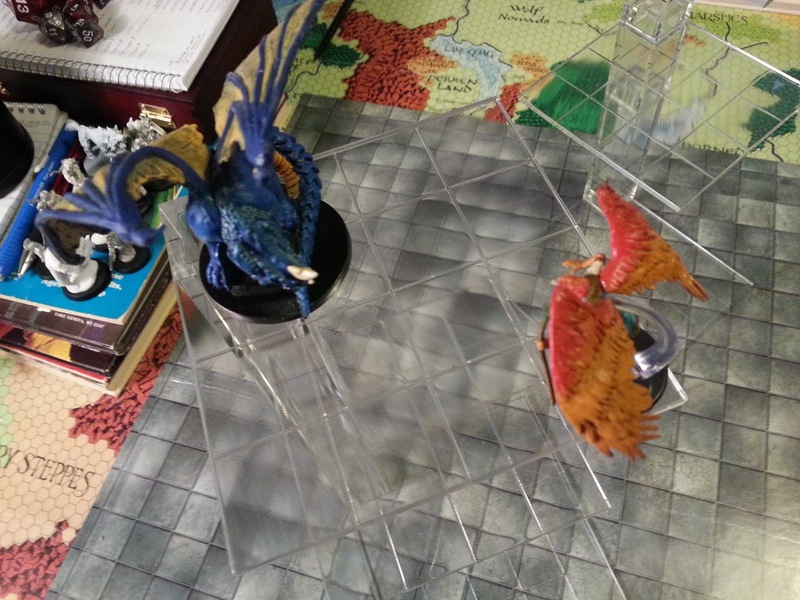 The flying platforms, at 15- or 16-square-inches, provide plenty of room to accommodate a number of models all flying at the same level - perfect for showing heroes fighting monsters at the same altitude. Each tier has plenty of room for a good number of man-sized models, or for one or two really big ones. Yeah, now that's WHY you need these! There are, however, a few minor issues. 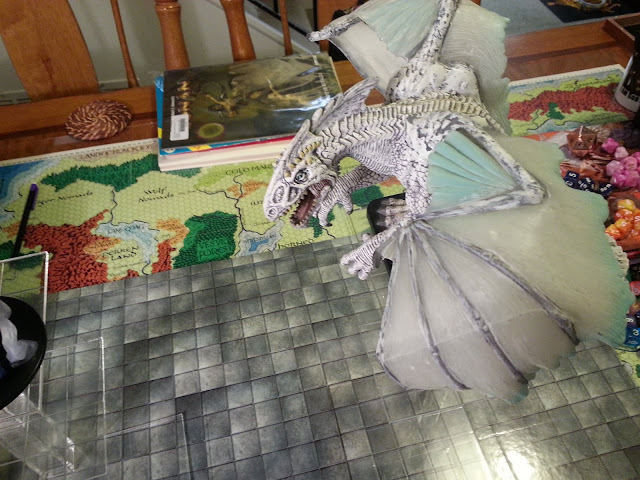 The array of pieces in the box is enough to accommodate a few flying models in a small encounter, but one set would likely not be enough to accommodate a game featuring a large number of flying models, especially not a number large ones or a bunch flying at a wide variety of different levels. 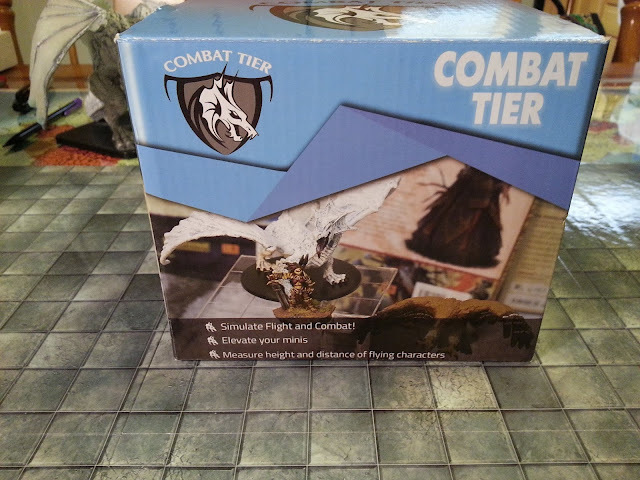 If you regularly have large encounters, or if you plan on using the tiers for skirmish/war games, one box may not present enough options to meet your needs. 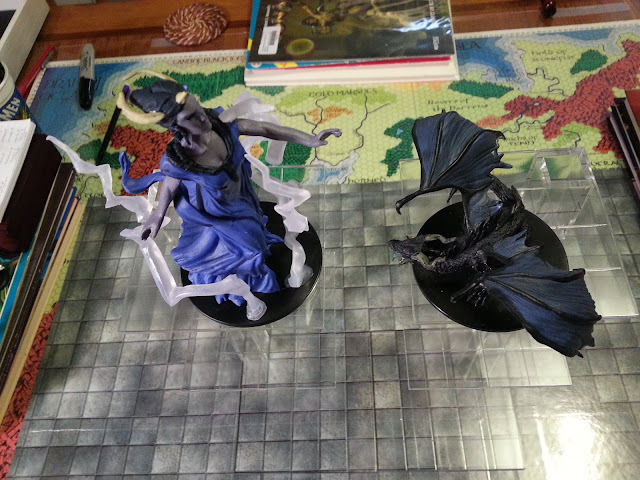 Another potential drawback is the width of the bases. Although a 25-inch-square base is awesome for stability, it can be a bit of an inconvenience, especially in cluttered encounters or on tables that use a lot of scatter or uneven terrain. It's certainly not a huge impediment for most of us, but you should consider if a base with a large footprint is acceptable for your needs before buying. By far the biggest inconvenience is that the connection point on each platform is in the corner, making the platforms unstable when placing larger models on them or building a high "tower." I haven't had them come apart, but they're definitely prone to bending, threatening to let a mini slip off if they or the game table are jostled. 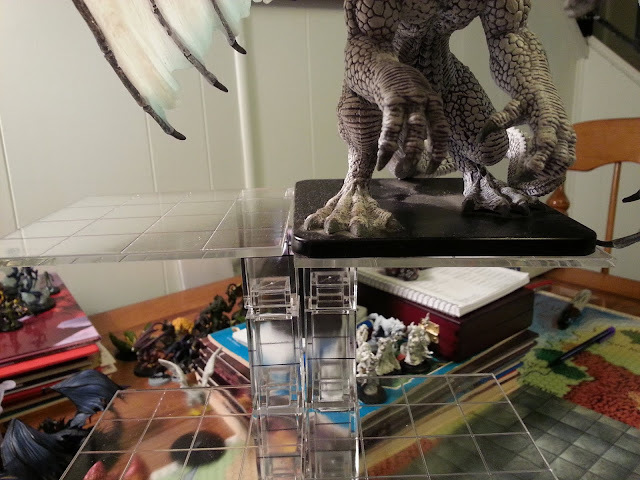 I wouldn't recommend placing anything with any real weight to it on the tiers - more than a lightweight plastic miniature, and you'd definitely be asking for trouble. I recognize that by placing the joint in the corner of each platform, Tinkered Tactics maximized the contiguous space that's available, allowing larger-based models to be placed with more freedom and reducing the footprint of the flying platforms (probably also reducing costs in the process). But that convenience comes at the cost of stability. ...nobody bump the table. I don't think this thing can actually fly. Now we get to the bad stuff. The platforms and risers are made of hard plastic, which makes them susceptible to breaking at the joints if too much stress is put on them. This is most noticeably problematic during assembly and disassembly, but seems like it could also be a potential problem when the assembled construction is too high, or subject to heavy load, and bends, as mentioned above. I haven't seen any breakage yet, but with continued use or with misuse, it definitely feels like it's a strong possibility. Another issue is connector fit. 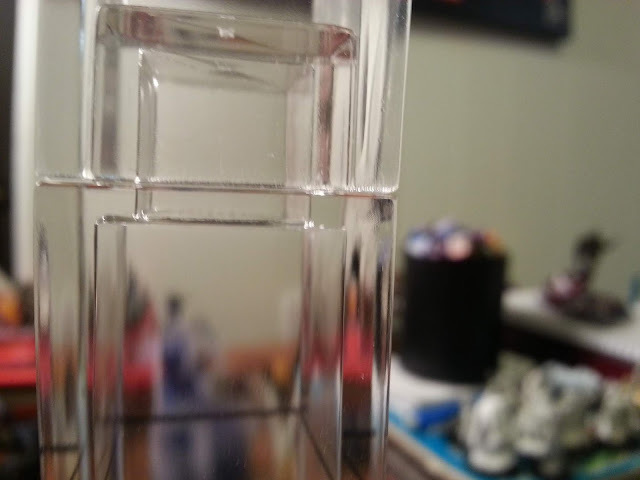 All of the joints in my set are fine, sliding in and out of each other easily - except for one. Combined with the aforementioned brittle plastic, this is worrisome. 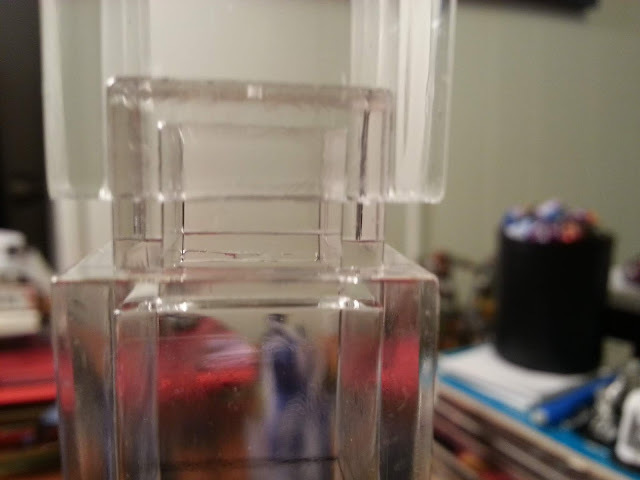 I can't force the pieces to fit tightly for fear of breaking one or both of them, so only about half of the male connector is seated into the female connector. Because of this, one of my towers is always a little weak at that joint, and is even more prone to bending, It's also tricky to get apart, requiring a good deal of extremely careful wiggling to free the joint without cracking the plastic. As long as you understand your needs and know what you're getting, Combat Tier could be a great addition to your gaming gear!